Sheer Fabric Curtains - Fun Choices! You won't find these gorgeous sheer organza tab-top curtain panels and matching table cloths in any department store. 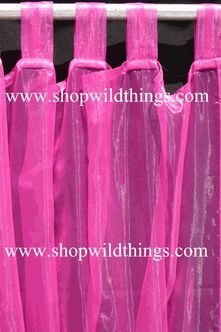 Choose sheer organza or sheer poly tissue organza curtains in a delightful array of colors available exclusively at ShopWildThings. Each super shiny window panel is 42 inches wide and 84 inches long with pretty acrylic crystal-faceted beaded trim. We carry matching sheer fabric table toppers, which are 54 inches by 54 inches in size. 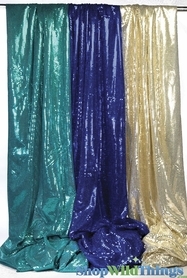 These organza tablecloths have acrylic crystal beads at each of the four corners. We have matching 10-inch x 108-inch matching garlands, too. Create fresh new looks in your home, restaurant, bed and breakfast or private beach house. Just slide a curtain rod through the tabs at the top to place your organza curtain panels. Choose from 15 colors, including fiery orange, lavender, chocolate brown, pink, lilac, green, aqua and copper. Table toppers 54" x 54"